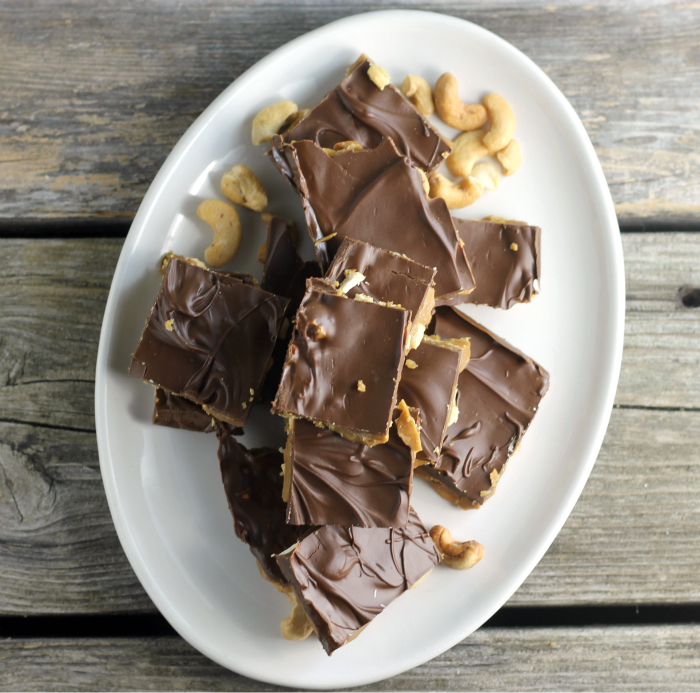 Easy chocolate topped cashew toffee a crunchy sweet candy that is made with only five ingredients, you are sure to fall in love with it. I am super excited about this post. I was rummaging through my mom’s recipes when I was at her house for Thanksgiving. I was looking for cookie recipes that she had made when I was a kid. That is when I stumbled across this recipe; I don’t remember my mom making this candy recipe when I was a kid. It sounded so simple that I decided that it was a must to make. My mom made a ton of cookies and candies for Christmas when I was a kid. I make some of the cookies that she made, but there a few that she made that I don’t have the recipes for. Unfortunately, I did not find all the recipes that I was looking for. Although I did find a recipe that she would make every year for my dad, it was his favorite . I will be sharing that recipe with you soon. 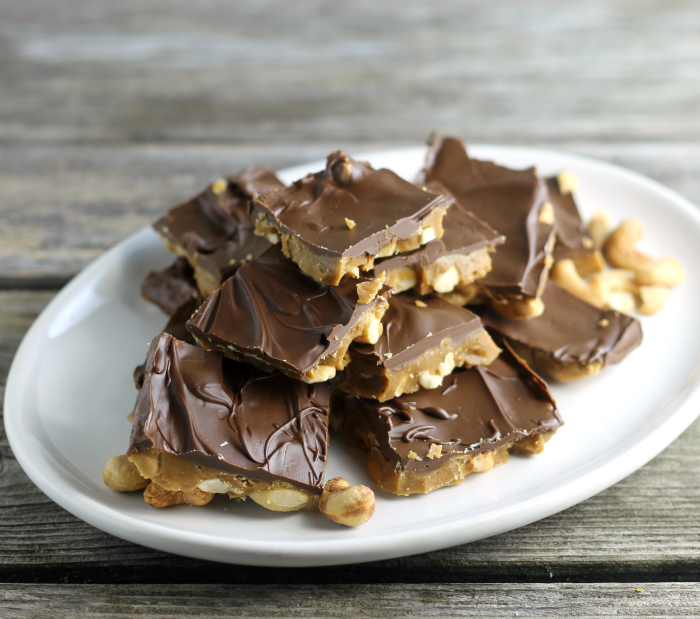 This easy chocolate topped cashew toffee is ready to eat in less than an hour. So if you are like me and make a variety of recipes for the holiday season, this one is perfect. I love recipes that take little time and taste so yummy. What is your favorite Christmas candy? 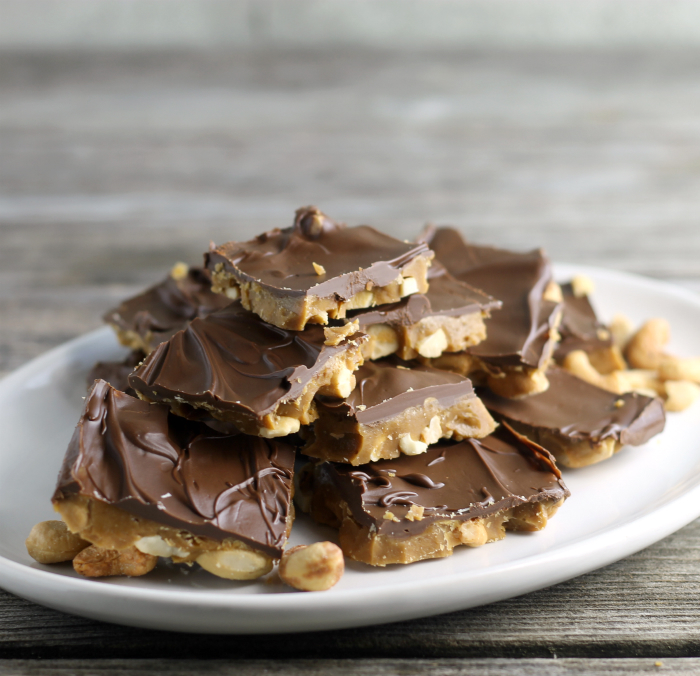 I hope that you will try this easy chocolate topped cashew toffee. Line an 8 by 8 baking pan with aluminum foil. Generously butter the foil and spread the cashews over the bottom of the pan. In a medium saucepan add the butter and brown sugar. Over medium heat bring this to a boil. Boil for 7 minutes, making sure that you keep stirring the mixture so it does not burn. After 7 minutes remove the pan from the heat and stir in the vanilla. Quickly pour the toffee over the nuts. (Make sure to pour the toffee over as much of the pan as possible, it hardens quickly so it is hard to spread). Spread the mixture to cover the nuts. Sprinkle the chocolate chips over the hot toffee and spread the chips until melted. 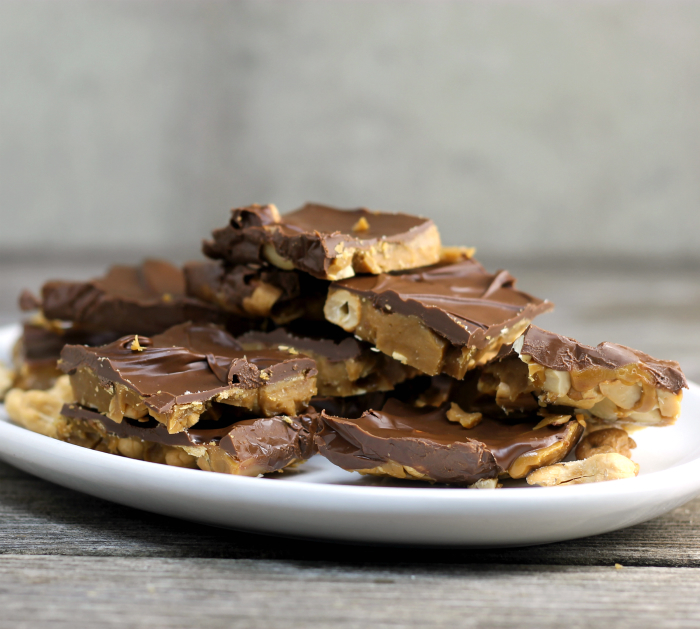 Let the toffee cool completely. Remove from the baking pan and then remove the aluminum foil from the toffee. If you like this recipe check out this one! Yes! Who doesn’t love toffee? And chocolate? This looks terrific — perfect for this time of the year. Thanks! These would be a hit at our home!